Will the Town of Berwick ever return to Scotland? Residents of the town of Berwick, on the English side of the border with Scotland, have reignited the debate on whether to return to Scotland after five centuries under English administration. The coastal town of Berwick-Upon-Tweed, which lies just two miles from the Scottish border and has a population of around 11,600, is often described as "Scotland's lost limb". What once was the greatest merchant city in the Scottish Kingdom, Berwick changed hands between Scotland and England at least 13 times until it finally ended up under English control in 1482. But five centuries of English administration do not seem to have settled the question about whether Berwick feels itself more English or Scottish. The town is administratively in Northumberland, England, but the local football team, Berwick Rangers F.C, play in the Scottish League, as well as the local rugby union club, Berwick RFC, who play in the Scottish Rugby Union. The town's river, the Tweed, is officially recognised as Scottish. The town, which looks very much Scottish architecturally, has some Scottish banks in the high street, where souvenir shops sell Scottish products alongside English articles. Berwick has also a St Andrew Society, a Church of Scotland with a large congregation, and the town's ceremonial robes are purple instead of scarlet, which goes back to its time as a Royal Scottish Burgh. The local accent is similar to Scots, and most importantly, Berwick is 57 miles from Edinburgh compared to over 300 miles from London. 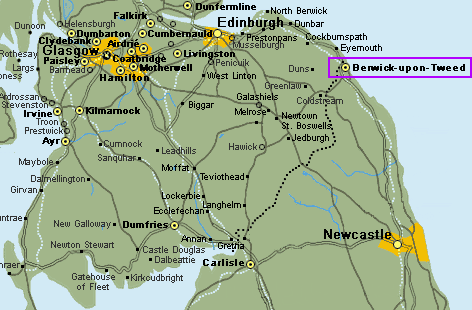 Berwick is also closer to Edinburgh than to Newcastle. The debate on whether the town should be part of England or Scotland has been a recurring topic for a long time, but now the people of Berwick have been asked to have their say in a poll, and the results have once again reignited the issue. Berwickers are proud of their history, as shown by a research which found that 50% of the town consider themselves Berwickers, 25% English, and 25% Scottish. But local newspaper The Berwick Advertiser decided to organise an online poll to ask their readers whether they would rather be governed by England or by Scotland. 78% of all those who voted said they backed reunification with Scotland. Following that result, the ITV current affairs programme Tonight decided to conduct a referendum in the town, asking residents whether they would like Berwick to be English or Scottish. The referendum saw 1,182 voters in favour of becoming part of Scotland and 775 in favour of staying in England, meaning that 60% of those polled wanted the town to return to Scotland. Producers of the TV programme highlighted that the poll turnout of 1,957 votes compared to some 3,800 in the last local elections. Retired teacher Barbara Herdman, who lead the pro-English campaign, argued that Berwick should remain in England because it has been part of that country for so long and because it would be far too complicated to change. She agreed that people living in Scotland enjoyed better social benefits, but she said she would rather like to see an increased spending by Westminster so that England could catch up with Scotland in terms of social benefits. Berwickers widely agree the town has long been a "forgotten" part of the country, run by a government hundreds of miles. Keith Hamblin also pointed out that "We are losing our borough council next year. It's being replaced by a new unitary authority, so all our administration wil be run 60 miles away further south. So people feel they're going to be left out even further on the frozen north." The ITV programme Tonight, which organised the referendum where 60% voted to return to Scotland, compared the level of public services in England and Scotland and showed how since the creation of the Scottish Parliament in 1999 Scots receive about £1500 (€1900) more government expenditure each year their English neighbours. The programme claimed the poll reflected Berwickers preferred the better financed public services available in Scotland, including free personal health care for the elderly or the lack of university tuition fees, both of which have to be paid for in England. Following the poll findings by the Berwick Advertiser and the ITV programme Tonight, South of Scotland MSP Christine Grahame lodged a motion at the Scottish Parliament calling on ministers to help Berwick join Scotland. Ms Grahame, a member of the governing party in Scotland, the Scottish National Party, told: "I think there is clearly support for returning the historic port town." "We would welcome Berwick-upon-Tweed's return with open arms", she said. The motion was supported by other parliamentarians and members from the same party, like prospective SNP parliamentary candidate for Berwickshire, Paul Wheelhouse, who believed that “Berwick would blossom on Scottish soil”. “The SNP, and all in Scotland, would very much welcome Berwick's return to Scotland, should the Berwickers living north of the Tweed themselves desire this to be the case”, told Mr. Wheelhouse, who said that after joining Scotland the people of Berwick would also benefit from reduced business rates, abolition of Council Tax, better bus and rail transport, besides free care for the elderly and the abolition of student tuition fees. Liberal Democrat MSP Jeremy Purvis, who was born and brought up in Berwick, joined the call to allow Berwick to return to Scotland. "There’s a strong feeling that Berwick should be in Scotland. Until recently, I had a gran in Berwick and another in Kelso, and they could see that there were better public services in Scotland”, he said. A spokesman for the First Minister of Scotland, Alex Salmond, confirmed that the Scottish Government would start legal moves to bring Berwick back in Scotland if the town's residents voted in favour in a referendum. The spokesman for the First Minister said there were precedents from around the world of towns changing hands from one government to another: "Borders are fluid and there would have to be negotiations, but there are precedents for this happening from around the world." Politicians opposed to Berwick joining Scotland claimed the change of administration would be too complicated and would not be worth the effort. Isabel Hunter, leader of Berwick-upon-Tweed Borough Council, admitted many people in the town wanted to enjoy public benefits that were available in Scotland but said: "I think it would just be too difficult. Everything here is governed by English law, and Scottish law is different, so everything would have to be changed. It would just be an utter nightmare." Alan Beith, the Liberal Democrat MP for Berwick-upon-Tweed, said: "Moving the Border is not a very realistic option and would take massive negotiation and legal change, so the urgent thing is to give people in north Northumberland services comparable to those in Scotland." 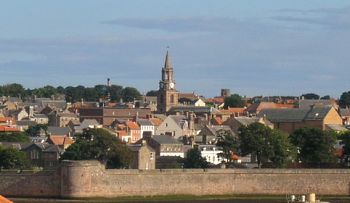 Like most of the south of Scotland, Berwick was inhabited by the Brythons, who were in turn conquered by the Anglo-Saxons, the Norse, and the Normans, until the area became a part of the Kingdom of Scotland in the 10th century. Berwick soon emerged as one of the wealthiest Scottish trading ports. King David I made Berwick one of Scotland's four Royal Burghs around 1120, granting the town many rights and privileges, and boosting an intense trade with the Low Countries and Germany, which by the 13th century generated as much as a quarter of all customs revenues in Scotland. The Scottish royal burgh passed back and forth between the two nations at least 13 times until in 1482 it was finally captured by Richard Duke of Gloucester, the future King Richard III of England. The town never regained the trading importance that had enjoyed as a part of Scotland, but became an important military outpost instead. Although the town was taken by the English in 1482, Berwick was actually never merged officially into England. As such it was defined in the Treaty of Perpetual Peace agreed in 1502 by the King Henry VII of England and King James IV of Scotland, which declared Berwick to be "of the Kingdom of England but not in it". For many years Berwick was a self-governing county on its own and British legislators had to pass a “Wales and Berwick Act” in 1746 to state that, unless specially specified otherwise, the term "England" in laws included also Berwick and Wales. In 1853 Victoria, Queen of “Great Britain, Ireland, Berwick-upon-Tweed and all British Dominions” signed a war declaration against Russia. The end of the war was agreed at the 1856 Treaty of Paris, which did not mention Berwick, meaning that, technically, the town had not signed yet peace with Russia and was officially still at war with one of the world's mightiest powers. The “state of war” between Berwick and Russia lasted for over a century until --it has been claimed but not proved-- a Soviet official visited the town in the 1960's and signed a peace treaty with the Mayor of Berwick, Robert Knox, who is reputed to have told him: “Tell the Russians they can sleep easy in their beds”.